By combining a trace element and a vitamin-like substance, both of which are essential to human health, Swedish researchers have managed to reduce cardiovascular mortality by over 50 per cent in a group of elderly people. In addition, the treatment appears to boost the heart function. Sweden is ahead of the game with a new study showing how elderly people can obtain substantially better heart health by simply including supplements of two natural elements in their daily regimen: A trace element called selenium and a vitamin-like compound known as coenzyme Q10. Both are essential to human health and by taking them in combination, elderly men and women can reduce their risk of dying of a cardiovascular disease by over 50 per cent. In addition to improved survival, people can give their heart function a natural boost with the combination of these two substances. The Swedish researchers report their findings in the International Journal of Cardiology. of selenium yeast (SelenoPrecise) and 200 mg of coenzyme Q10 (Bio-Quinone Q10), or identical dummy pills (placebo). 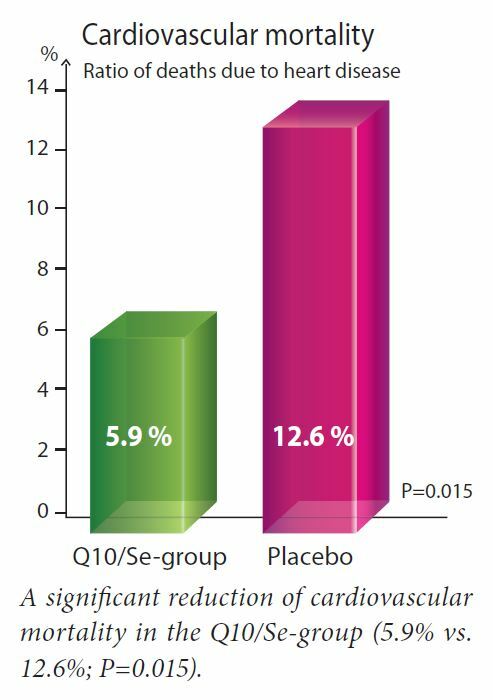 After a five-year follow-up period, the scientists noted that more than twice as many people in the placebo group had died of cardiovascular disease compared with the group that got the combination of selenium and coenzyme Q10. What is more, the volunteers in the active treatment group showed distinct signs of improved heart health on two different accounts. First of all, the researchers observed how levels of something called NT-proBNP (a substance that gets produced in the heart ventricles) were significantly higher in the placebo group. As levels of NT-proBNP go up in response to extensive stretching of the heart muscle tissue, this is an indication that the heart muscle is working under increased stress. In fact, NTproBNP levels are routinely used to predict potential heart failure. Secondly, the heart muscle function in the active treatment group, as shown by means of echocardiography, was substantially better than what was seen in the placebo group. In other words, the echocardiographic measurements support the positive effect of the supplements. More research needed It is not possible with this study alone to generalize the results. However, the researchers suggest that the results of their study may provide a basis for extended analyses of the effect of selenium and coenzyme Q10 on various conditions, and that further supplementation studies in larger populations involving more diverse age groups should be initiated. Source: Alehagen U, et al. Cardiovascular mortality and N-terminal-proBNP reduced after combined selenium and coenzyme Q10 supplementation. Human health depends on selenium, a vital trace element that supports an array of functions, ranging from immune system and cell defence to thyroid functioning and fertility. Coenzyme Q10 is present in all human cells where it is a component of the electron transport chain and takes place in aerobic cellular respiration, generating energy in the form of ATP (adenosine triphosphate).